Children get their ideas from somewhere. Hard to believe this was just one of those overheard unscripted quirky conversations children have. It's pretty appalling to imagine adults teaching and prompting these lines for the camera. 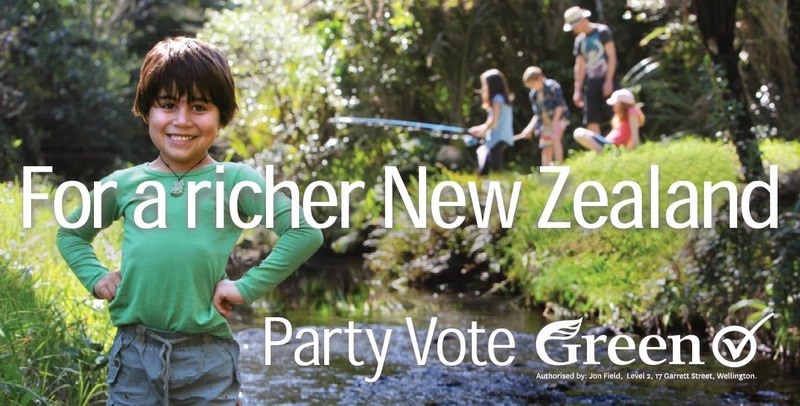 But the Greens have never been above using children to buy votes. Dale Carnegie, the head of Engineering at Victoria University, writes in the NZ Herald about the consequences of NCEA. I don't want to politicise this particularly but I was dead against NCEA. In 2002 NCEA opposition was one of ACT's main policy planks. 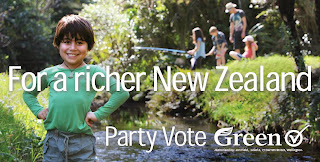 I recall putting up the large billboards around the Hutt South. My main concern was that it would dumb down or de-motivate bright kids. That the grading was just too broad. My child is currently practising for Level One next year. She comes home with grade and remark, "Excellence, but if you'd done so and so you'd get a stronger excellence." But there is no 'stronger excellence'. So why bother to go the extra mile. NCEA has been successful in many areas, especially keeping students in school longer. However it is very clear from our research that for very many students NCEA is not effectively preparing them for engineering study at university. Our research over a large number of first-year engineering students reveals a systemic problem with the concept of the "achieved" NCEA grade. This grade spans a huge range - it can include excellence-level students who have made some minor errors, through to students who really have not gained competence in the material. Many potentially capable students report that they just "cruised through NCEA" knowing they would be able to obtain the achieved grade with minimal work. A failed assessment is "no big deal"as often they get to re-sit that assessment. When they take that work ethic and expectation into University study, they are in trouble. The result is that there is significant variability in "achieved-level" students' study habits, work ethic and subsequently, actual subject knowledge. Compounding this issue, we are aware of secondary schools that actively discourage students who have only gained an achieved grade in mathematics at NCEA Level 2 from enrolling in that subject at Level 3. This seems to be due to a concern that those students might fail, with a consequential adverse effect on that school's league table standings. This removes many potential students from even being able to consider enrolment in engineering. At the core of the problem is the lack of a real, meaningful grade. I advocate for a return to real percentage scores - these motivate students to improve themselves, to gain the best score they can. It would end the farce of excellent students receiving an achieved grade due to one or two minor mistakes. It would give the universities a real understanding of student ability. ACT on Campus President Taylor Warwood today thanked John Banks for his contribution to ACT in the past two years. "John Banks has worked tirelessly in and out of parliament to achieve valuable goals. He has successfully overseen the introduction of Partnership Schools legislation, and has a voting record we in ACT on Campus can be proud of," said Mr Warwood. "In particular, we thank him for his support of marriage equality, keeping the drinking age 18, and opposing the testing of party pills on animals. "John is a politician of true integrity who cares about New Zealand. It will be sad to see him go. "However, ACT is more than just John Banks. The party now has an exciting opportunity to rejuvenate itself, and we will welcome attention being refocused onto ACT's many potential candidates. "ACT on Campus will play an active role in the selection of candidates and we welcome other young liberal kiwis to join us in this process." Whoever wrote that, take a bow. It's honest, it identifies concretes instead of employing woolly platitudes and most importantly, reaffirms ACT's liberal credentials. With the advent of the Conservative Party, ACT no longer needs to cast its net in that direction. I really do see Bank's retirement as an opportunity, but like ACT on Campus, would like to sincerely thank him for his animal welfare advocacy. Only recently the Legatum Institute rated NZ Number 1 in the world in education rankings. They base their analysis on things like teacher/pupil ratio, enrolment and perceptions about the education system. Matters that governments can control. They do not appear to rate by individual achievement or performance. The OECD measures the actual performance of students by testing 4,000 and delivers a different result. NZ is slipping in Maths, English and Science. Although the rankings could fairly be described as "plummeting" the absolute scores haven't dropped radically. I heard one commentator talking about the worsening results being down to the "rich getting richer and the poor getting poorer." But the one trend that is 'up' is achievement by immigrant students. If immigrant students generally fall into lower income groups (I am making that assumption but could be wrong) then that doesn't stack up. Another incongruity arises too. The OECD report apparently finds the gap between achievers and non-achievers is larger than any other country. Maori have traditionally featured disproportionately among the non-achievers. Over 36,000 Māori stated a bachelor’s degree or higher as their highest qualification at the 2013 Census – a more than 50 percent increase since 2006. It's difficult to square all of this up. MSD are apparently going to begin "home visits" to sole parent support beneficiaries to check whether they are indeed single. But they intend conducting them 14 weeks after application. So only new applicants are scrutinised? 14 months or 14 years after any application would probably reveal more fraud. In any case even if they find the beneficiary is living with a partner there are a number of ways she can challenge having her benefit stopped. Just read up on the Ruka Ruling in the MSD manual. I don't particularly like this state snooping stuff (but can accept the legitimacy of it). It's been done before in 1980 under George Gair, a National Minister and sparked outrage then, with an Evening Post headline, BENEFIT CHECKERS DENY 'GESTAPO' TAG. Here's the thing. If the benefit was strictly time-limited, if everybody had clear expectations that the degree and amount of assistance was tightly controlled and not open-ended (it effectively remains so despite the reforms) then the need to police welfare in this manner would disappear. But Labour social development spokeswoman Sue Moroney said the visits would be "complete overkill", levelling suspicion at people who had done nothing wrong. "If only they would put their money into putting people into paid employment, rather than bringing in the thought police," she said. The "thought police"? What has freedom of speech and expression got to do with people defrauding the taxpayer? MSD aren't checking if beneficiaries are thinking about fraud; they are checking whether they are committig it. The Ministry of Social Development’s procedural policy requires staff home visits to beneficiaries be in pairs due to security concerns. During 2001/02 however, an experimental project involved unaccompanied home visits to discourage the pursuit of a benefit application. On this occasion, staff members were trained to use cell phones for security, not make home visits out of cell phone range and to leave the property at the first sign of danger. Some case managers declined to participate. This piece of personally addressed electioneering material arrived in my letterbox today. Mrs Lindsay Mitchell was the only voter in this household to receive one. Makes me wonder about a number of things. 2/ Why did they put up the postshop/kiwibank locator web address to help me "find a post office or box near you"? What moron doesn't know where the nearest post box is? Or is this just subliminal messaging about kiwibank and its connection to Labour? 3/ Why has Labour left it until after many people will have already received and returned their voting papers to embark on this exercise? 4/ Why was I selected from the electoral roll? 5/ Was it purely random or do they have a target group? 6/ The message doubles as a recruitment drive for Labour so again, how are they profiling targets? 7/ Does Labour think older married women will be particularly receptive to their advances (oh look the little wife got mail in her own right?) and have they given up commuicating to men? 8/ Have I simply found my way onto one of their databases because I am politically active? Too late Labour. Voted 'yes' over a week ago. 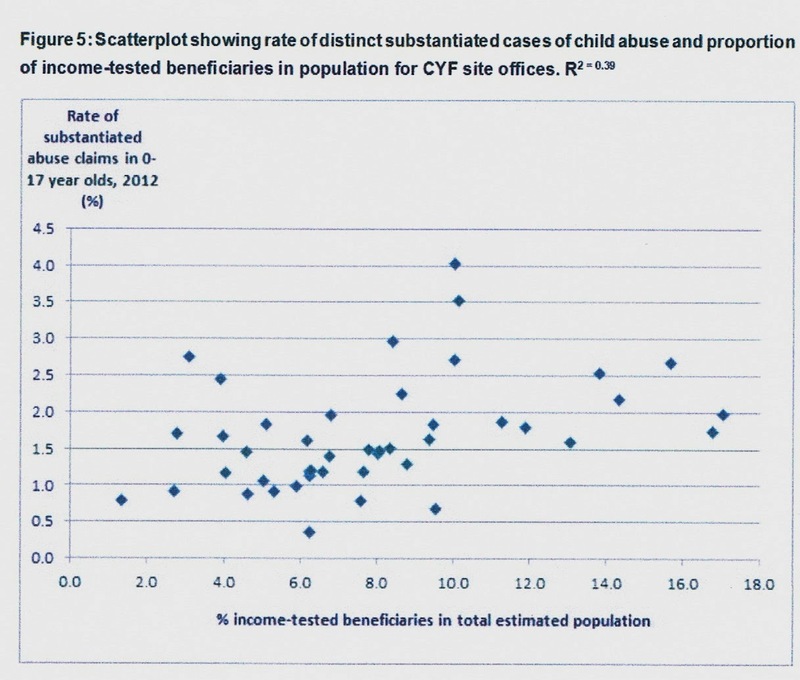 The Child Poverty Action Group recently re-released this scatter plot (amended at the y axis after I pointed out their ealier calculation error) depicting the percentage of child abuse in each CYF site office against the rate of benefit dependency in each site office area. 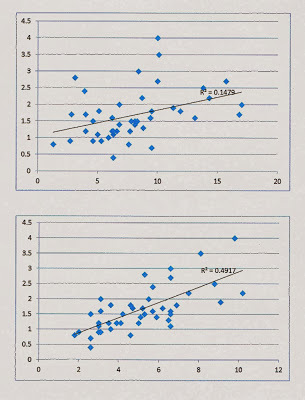 Along the x axis they plotted, "% income-tested beneficiaries in the total estimated population". I argued with them that they should have used income-tested beneficiaries with dependent children if attempting to assess any association between child abuse and benefit dependency. Including everyone on an unemployment, sickness and invalid benefit would skew the result in my view. To make my point I requested the relevant data from MSD. 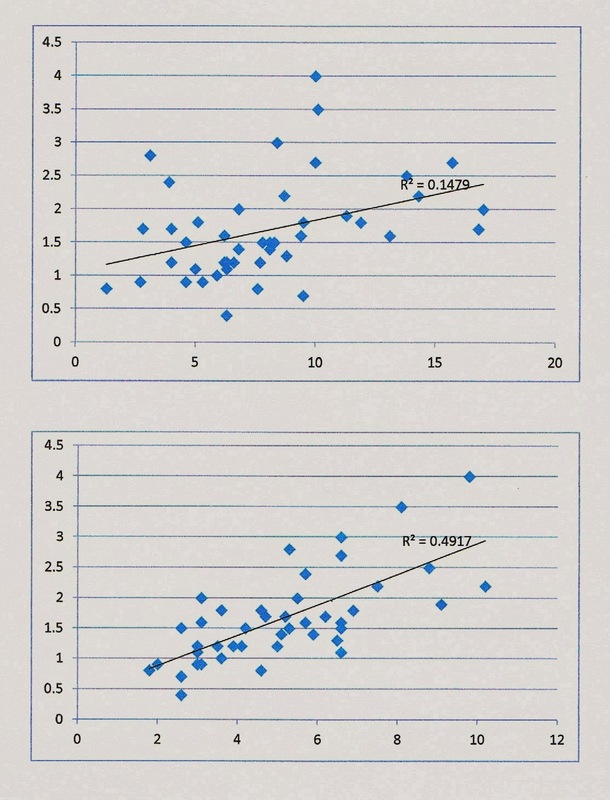 Below, in the first graph, I have used the CPAG data (available at their appendices) and recreated their scatter plot (the pattern is naturally identical to the one above). 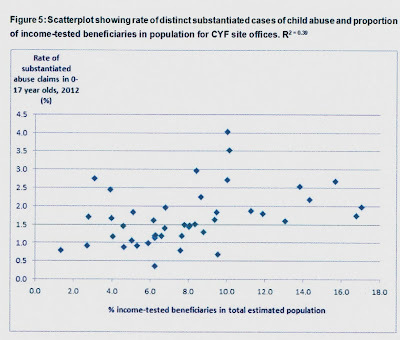 In the second graph I have used the same CPAG data for child abuse (Y axis) but entered the new income-tested beneficiary with dependent children as a percentage of the 18-64 year-old population data (X axis). As expected the correlation has strengthened markedly. But also ask yourself why they would do this. CPAG believes that children are poor because benefit payment rates are too low. They cannot accept there is anything inherently problematic with being on a benefit long-term barring children don't receive enough income from the state. If the public starts to believe that benefit dependency is a significant risk for children then CPAG is in trouble. And so are the electoral chances of the Greens and Labour, both promoting higher benefits.